Andrew F. Smith, editor in chief. 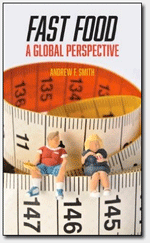 New York: Oxford University Press, 2007. A sweeping reference work on food and drink in America, with fascinating entries on everything from the history of White Castle to the origin of the Bloody Mary, The Oxford Companion to American Food and Drink provides more than a thousand concise, authoritative, and exuberant entries, beautifully illustrated with hundreds of historical photographs and sixteen pages of color plates. 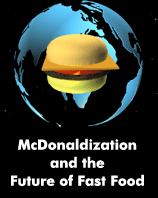 This entertaining and informative reference serves up everything you could ever want to know about American consumables and their impact on popular culture and the culinary world. The Companion offers delightful entries on fast food, celebrity chefs, fish, sandwiches, regional and ethnic cuisine, food science, and historical food traditions. Readers will find fascinating discussions of Applejack and apple pie, barbecue and baked Alaska, Dairy Queen and Delmonicos, lemonade and licorice, mayonnaise and marshmallow fluff, Popcorn and pretzels, spinach and Spam, vegetarianism and Velveeta. 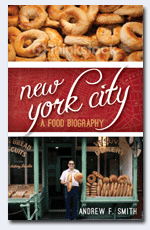 The volume also includes informative lists of food websites, museums, periodicals, organizations, and festivals. 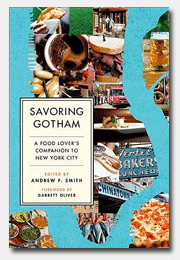 Ideal for the food enthusiast and food scholar alike, it is equally appetizing for anyone fascinated by Americana, capturing our culture and history through what we love most – food!